Understand Want to know more? Deepen your understanding of Rear Cross Traffic Alert. Challenge Up for a challenge? Tackle a few challenging scenarios using Rear Cross Traffic Alert. 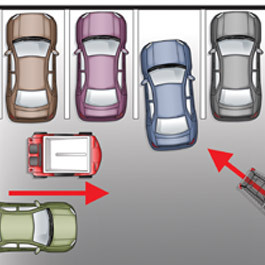 Rear Cross Traffic Alert is designed to help you back out of spaces where you may not see approaching traffic, as sometimes happens in parking lots. Rear cross traffic alert monitors two areas behind you for vehicles approaching from the right or left. Rear cross traffic alert is active once the vehicle is shifted into REVERSE. When backing, you will receive a visual or auditory warning if an approaching vehicle enters the rear cross traffic alert detection areas. The visual warning may appear on the dashboard, rear view mirror, or side mirror. For example, if traffic approaches from the right, the light will appear on the right side of the dashboard or rearview mirror, or the right-side mirror. Rear cross traffic alert is often paired with back-up cameras. 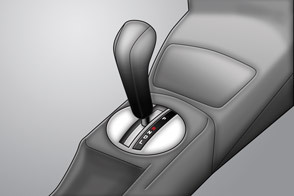 When you shift into REVERSE, both systems will automatically turn on. When backing out of a space, reverse slowly. 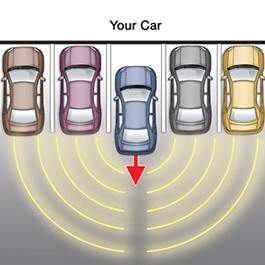 The rear cross traffic alert system will alert you when other vehicles are detected near or in your backing path. Once the rear end of your vehicle is beyond adjacent objects and vehicles, the rear cross traffic alert system will then have a clear view of traffic approaching from the left or right. When using rear cross traffic alert, you must always check over your right left shoulders and be cautious when backing up. 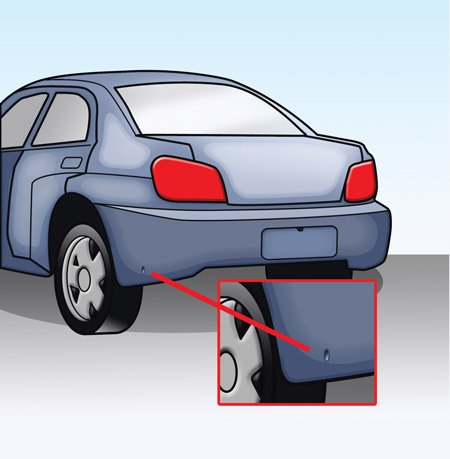 Sensors, which can use radar or ultrasonic waves, are located at each side of your vehicle near the rear bumper and look like buttons. Typically, your rear cross traffic alert will use the same sensors as a blind spot monitoring system (if you have one). These sensors monitor both sides of your vehicle in the detection areas. When an approaching vehicle is detected, your rear cross traffic alert system will provide a warning light and/or a warning sound. Rear cross traffic alert is not designed to detect small motorcycles, bicycles or pedestrians. 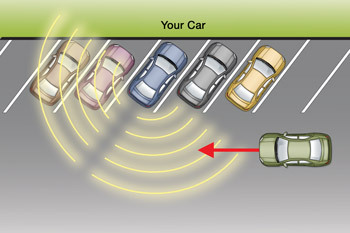 It may also fail to detect vehicles that are approaching from directly behind you or moving away from your vehicle. 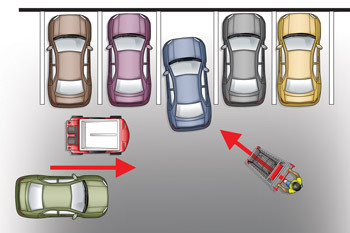 Additionally, most rear cross traffic alert systems are designed to work best in straight parking situations (like the one above) and may not work as well in angled-parking situations. Your rear cross traffic alert works when you are backing straight out of a space or driveway. It is not designed for angled parking spots. For example, in the image, when your car is parked at a sharp angle, the detection areas are angled in the same direction. 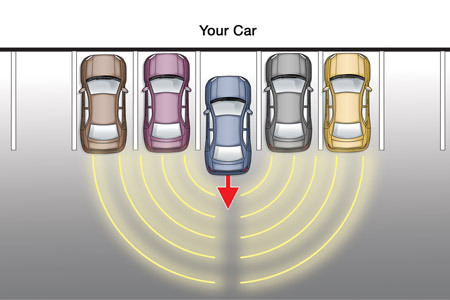 In this situation, notice which cars are in the detection area and those that are not. Imagine yourself backing out of the parking space in the image. 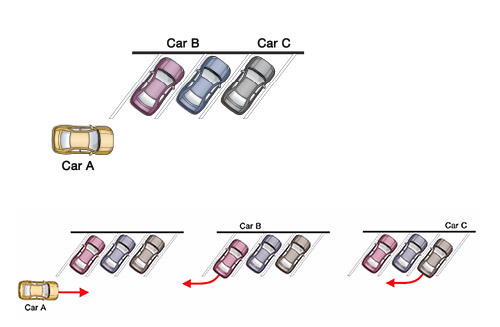 In turn, imagine each of the cars moving and consider the questions below. 1. 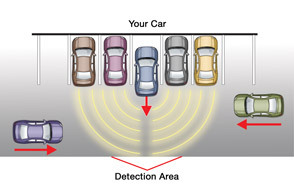 When would your rear cross traffic alert system detect each car? 2. What should you do? Car A: My rear cross traffic alert may not detect this car as it passes behind me. I should always monitor the area around me carefully. Rear cross traffic alert does not always work in angled parking situations. Car B: My rear cross traffic alert may not detect this car if it is moving and I may not receive alerts. Car C: My rear cross traffic alert will not detect this car until it is already directly behind me. I should watch carefully for cars moving to the right of me, as this may be dangerous. Your rear cross traffic alert is dependent on sensors. If the sensors are blocked, your rear cross traffic alert may not work properly. For example, in the image to the right you are parked by a wall that obstructs your left sensor. As a result, your rear cross traffic alert system may not detect cars approaching from the left. 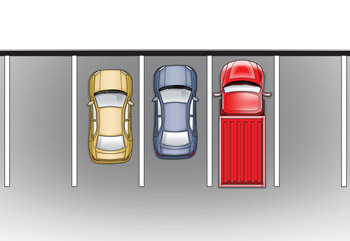 Imagine you are backing the red car out of the space in the image. Think about the questions shown below. 1. What problems might there be if you are using your rear cross traffic alert? Why? My rear cross traffic alert may not detect the cars coming from the right, because the right sensor may be obstructed by the large truck parked adjacently. I should back up slowly until the back end of my car is beyond the truck bed. Your rear cross traffic alert has a detection range in terms of the speed of the objects. For example, in some systems, your rear cross traffic alert can only detect objects between speeds of 3 and 20 mph. If an object is moving too fast or too slow, your rear cross traffic alert may not detect it. So, as you normally do, back out slowly and look for traffic—especially fast moving traffic. 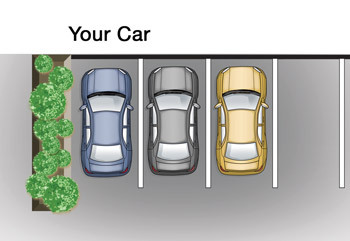 In the image, imagine you are backing the blue car out of the space. Think about the question shown below. 1. Which objects cannot be detected by your rear cross traffic alert? 2.Why can your rear cross traffic alert not detect them? My rear cross traffic alert can only detect objects between speeds of 3 and 20 mph, so it may not detect the shopping cart. For the car and the golf cart, it depends on their speeds. Additionally, smaller objects such as shopping carts may not be easily detected by the sensors.